Positive outlook from oil & gas, pharmaceutical, surfactants and agriculture industry should drive internal olefins market size. Increasing urbanization & industrialization rate and growing vehicle ownership along with shift in preference for luxurious lifestyle may propel product demand. Rise in crude oil exploration & production have resulted into increase in oil drilling process. Internal olefins are widely used in oil drilling as oilfield chemicals. It is added in drilling muds to minimize drill cuts and reduce impact on environment. North America accounted for drilling of over 18,000 wells in 2016 owing to strong presence of shale oil & gas resources. Favourable government initiatives and huge investments in oil drilling & shale gas exploration activities should boost well drilling. Increase in environmental concerns prominently in oil & gas sector has led to usage of environmentally safe synthetic fluid bases to improve oil & gas drilling, subsequently enhancing product demand. Strong application scope in lubricants industry should drive internal olefins market size. Rapid industrialization owing to high investments in this sector along with shift in consumer preference towards luxurious lifestyle has led to growth of personal vehicle ownership. Internal olefins are preferred over its counterparts due to its thermal stability, wear & tear protection, low friction, good load carrying capacity. Global synthetic lubricants market is poised to surpass USD 5 billion by 2024, owing to growth in automotive sector in India, Brazil and China. The product is categorized as biodegradable and low toxic chemical which is likely to support minimum carbon emission thereby stimulating product demand. 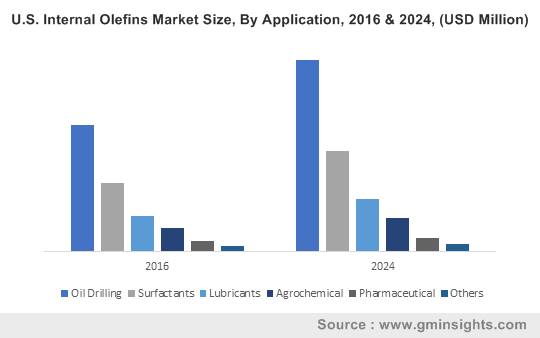 Substitutes including alpha olefins, LAO and PAO which have enhanced properties and high purity may pose threat to market growth and affect internal olefins market price trend. Easy availability and cost effectiveness of ethylene as prominent raw material for the substitutes which have strong application outlook in oil drilling and lubricants may limit industry growth. Internal olefins market size from oil drilling applications should exceed USD 1 billion by 2024. It is extensively used in drilling muds owing to its stability at high temperatures, lubricity and well-bore stability. It provides sound drilling operations compared to other terminal olefins as it is less toxic. It protects equipment in case of offshore drilling as it forms invert emulsion muds by repelling water layer. Stringent regulations by EPA & REACH pertaining to oil & gas industry and the environmental damage cause by the process along with technological developments supported by companies switching over enhanced techniques for oil recovery has led to rise in use of appropriate synthetic based fluids for drilling operation thereby driving product demand. Internal olefins demand from lubricant applications may witness gains at over 4% by 2024. They are added in synthetic lubricants owing to its superior characteristics such as thermal stability, hydrolytic stability, solvency, lubricity and biodegradability. It is widely used in engine oil & industrial lubricant applications as it minimizes sludge formation and prevents oil thickening, thereby increasing lifespan and performances of vehicles and machines. Favourable regulations such as eco label status to synthetic lubricants along with growing popularity in industrial applications owing to various advantages over conventional lubricants will stimulate internal olefins market size. Internal olefins from surfactants application may surpass USD 350 million by 2024. Increasing demand for personal care products and specialty chemical will drive surfactants market size. The product is being utilized in wide range of detergents and surfactants including shampoos, light & heavy-duty liquid detergents, dishwashing liquid and liquid hand soaps. Internal olefins are less toxic and biodegrades quickly making the surfactants free of sensitizers and skin irritants. Shift in consumer preference towards better quality and branded personal care products coupled with increased demand of detergents in household and industrial applications should positively influence product demand. Europe internal olefins market size, driven by Germany, Russia and UK should witness gains at over 3.5%. Strong presence of automotive giants along with strict environment norms implemented by REACH will propel product demand. Automobile manufacturers need to comply with safety and environmental norms to provide environment friendly products. Positive application scope in automotive and industrial sector will fuel product demand. China internal olefins market size should witness significant gains due to growing automotive sector. Rise in agrochemicals in agriculture industry owing to food safety along with growing consumer awareness regarding healthy lifestyle and quality personal care products will enhance product demand in the region. Brazil internal olefins market should witness gains at over 3.5% by 2024. Rising population level have resulted into higher demand of food and limited usage of insecticides & fertilizers along with adoption of new technologies regarding food safety should positively influence regional industry growth. 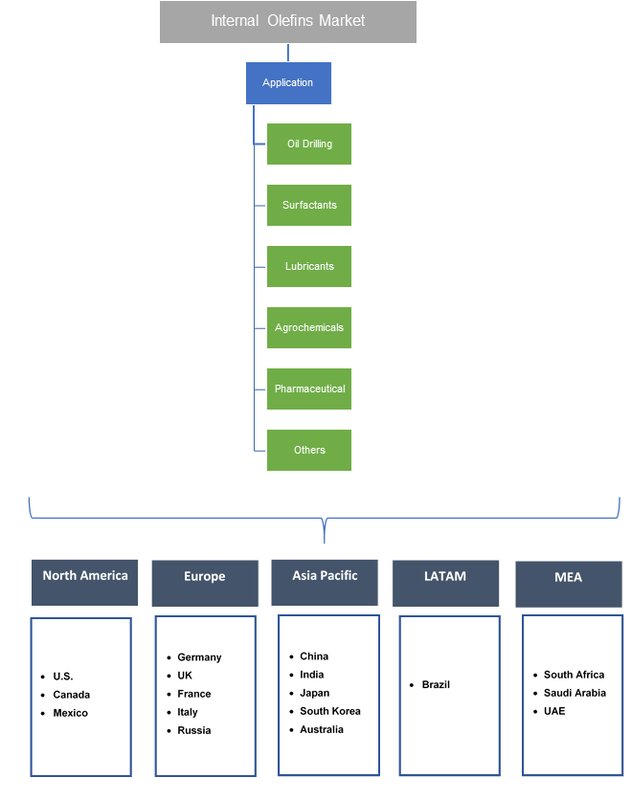 Global internal olefins market share is moderately concentrated. Royal Dutch Shell, INEOS Oligomers, Elevance and Sasol Ltd are the prominent industry players. Shell manufactures the products through Shell Higher Olefin Process (SHOP) by using ethylene as key feedstock. SHOP process is considered to be low cost, high performance, and environment friendly. SHELL manufactures these products under brand name NEODENE. Companies are focusing to increase manufacturing capacity to serve demand from oil drilling applications. Companies may also form strategic alliances to enhance their regional presence. Internal olefins are class of higher alkenes with middle range carbon atoms from C10 to C13 which are synthesized from alpha olefins with range from C16 to C18 with terminal double bonds carbon atoms. It has superior properties such as biodegradability, hydrolytic stability, lubricity, solvency and thermal stability, making it ideal for oil & gas and surfactants industries. Increasing oil drilling platforms owing to growing demand of oil & gas along with stringent government regulations regarding environmental concerns will drive market size.